Let’s see some of the amazing Health Benefits of Edamame bean. What is edamame ? Are edamame soybeans ! 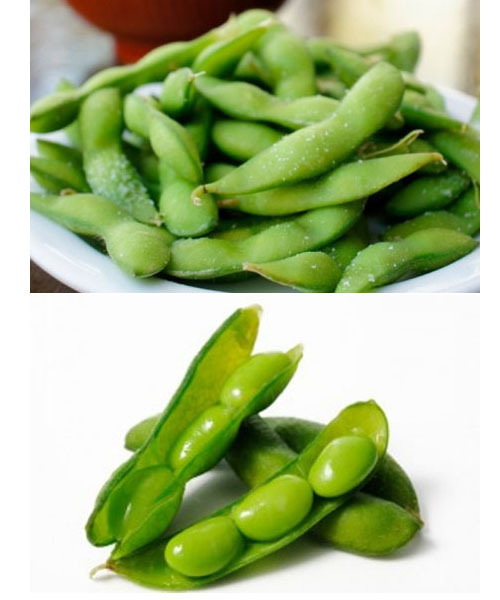 Edamame also known as Branched Bean or Beans on Branches, young soybean, and green soybean is a type of vegetable. It is a Japanese dish of salted green soybeans boiled in their pods, typically served as a snack or appetizer. These beans is harvested before the beans have had a chance to harden. They are available fresh or frozen, can be boiled whole, then shelled and eaten as a snack or added to stir-fries, soups or salads. It is popular in China and Japan for thousands of years and is now available in most grocery stores throughout the United States. These beans are naturally gluten-free and have low calorie with no cholesterol and is an excellent source of protein, iron, and calcium. This beans are rich in protein, low in calories and supply the body with 17 grams of protein, equivalent to 30% of recommended daily allowance in men and nearly 37% in women. They have high-protein and low-fat, such diet makes you feel less hunger between meals and are successful at losing significant amounts of weight. The folate in these beans may help with depression by preventing an excess of homocysteine from forming in the body, which can prevent blood and other nutrients from reaching the brain. It contains calcium, phosphorus, iron, vitamin E, and other nutrients that are required for maintaining healthy bones. The high edamame fiber content in it assists in reducing the risk of developing cardiovascular diseases. It contains mono and polyunsaturated fatty acids omega-6 fatty acids which the body can convert to EPA and DHA compounds.These compounds are associated with reduced blood cholesterol and fewer heart diseases. This bean is rich in copper which your body needs to keep the immune system healthy and functioning properly. In soy, genistein is the predominant isoflavone which also contains antioxidant properties which inhibit the growth of cancer cells. For Moderate amounts of soy foods do not affect tumor growth or a woman’s risk of developing breast cancer. This bean is a rich source of fiber content which is important for proper digestion process and plays an important role for ensuring that cholesterol is maintained at the right levels, thereby reducing the risk of stroke and heart attack. Fresh green soybeans are a great addition to stews, side dishes, and salads. It is a terrific vegetarian protein source and adds extra flavor to many dishes. Roasted Edamame, green soybeans are low in fat, plus loaded with the perfect energy-boosting mix of carbs, protein, and fiber. Some of the common recipes is: Super Green Salad, Provencal Style Sautes, Ginger Dip and Egyptian Stew.